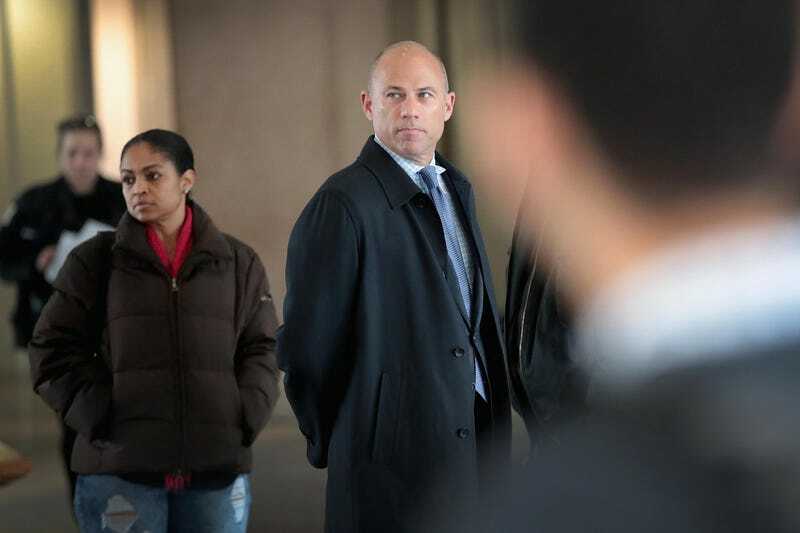 Attorney Michael Avenatti arrives for a bond hearing for R&B singer R. Kelly at the Leighton Criminal Court Building on February 23, 2019 in Chicago, Illinois. Kelly, who is facing charges on ten counts of aggravated criminal sexual abuse, is being held on $1 million bond. Avenatti represents one of Kelly’s alleged victims. On Monday, the Manhattan U.S. Attorney’s Office charged attorney Michael Avenatti with trying to extort more than $20 million from Nike “by threatening to issue damaging allegations against the company unless it paid his client millions,” The Washington Post reports. Because Avenatti is a kind lawyer who rose to national fame by representing adult-film actress Stormy Daniels in her claims against President Trump, he also offered the company another out: “a total payment of $22.5 million from Nike to resolve any claims (the client) might have and additionally to buy Avenatti’s silence,” charging documents viewed by the Post claim. Avenatti has not commented on the charges. This story is breaking. Please check back for updates.